Puppy to empty box: Take THAT! 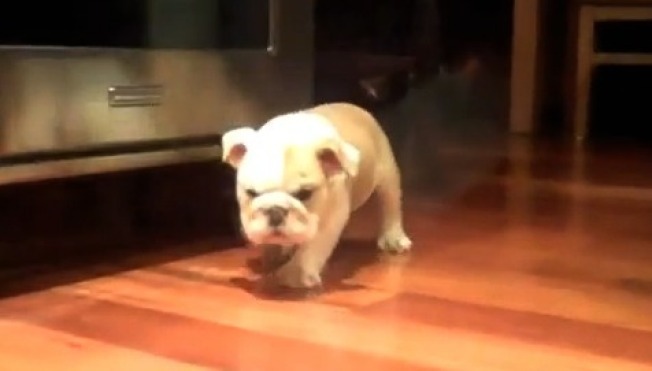 A stubbular bulldog puppy is undergoing intensive training -- jogging (um, flopping onto a squishy rug) and boxing (er, gnawing on an empty Girl Scout cookie box) -- in anticipation of taking up the mantle of Georgetown University's newest mascot. A welcoming event outside Healy Hall Friday at 4 p.m. will introduce the round-bellied bundle of joy to his adoring fans. Jack Jr. arrived from California earlier this week as a present from Janice and Marcus Hochstetler, who have a son and a daughter at the school. We just hope that his predecessor, Jack the Bulldog, almost 9, is handling this all OK. (This version of) Jack has served as mascot since 2003, although various Jacks have been at the school since 1962. Jack Sr. injured his leg earlier this spring in the midst of a distinguished career, and now he suddenly has to share the limelight with a Johnny-Come-Lately who makes YouTube videos in which he and his equally adorable littermates tussle over a shoe. We hope Jack Sr. can suffer this shocking turn of events with typical bulldog dignity. But -- OH LOOK, THAT PUPPY IS SO CUTE!! !